We love a couple of good Low Carb Cocktails, especially on date night or alongside a heated match of Scrabble! For these recipes we joined up with Zevia to bring you two of our favorite cocktails. We are already big fans of their sodas and energy drinks, so we knew we would love having the Ginger Beer, Dry Lemon Lime and Tonic Water mixers on hand for nights in need! Check out the video of us making them! After being sent Zevia Mixers we may be addicted to low carb cocktails. Tonic water has always been out of the question and most mixers and diet sodas usually have some questionable ingredients. However, Zevia makes the choice easy not only with these new mixers, but also with their sodas and energy drinks! Below we made a Strawberry Lemon Lime Cocktail and a Loaded Bloody Mary (our personal favorite)! One is sweet and refreshing and the other is basically a meal in and of it's own. You can't go wrong either way! We often get asked if drinking is possible on a ketogenic diet and if so, what we can drink! Well, low carb beers are available and you can check out our comprehensive breakdown on the best low carb beers HERE. Wine is also a viable option, but can be tricky since you never know how many sugars are in each bottle or glass. But, in our opinion the best option is always liquor. Vodka has no carbs, however, one thing to note is that it can temporarily stall your ketone production. If you choose to drink, choose wisely, stay hydrated and try one of our cocktails using the Zevia mixers! With events always around the corner to have reason to celebrate, these mixers and cocktail recipes will definitely come in handy! We always recommend finding a good balance in life because at the end of the day you want to live a lifestyle that is sustainable long term. We are always on the lookout for low carb, keto friendly products, such as Zevia sodas and mixers, and we do our best to share them with you. What we love so much about Zevia and using their mixers and sodas when we make low carb cocktails is that we can trust the ingredients and we know stevia isn't harmful to our keto diet! Use the Zevia Ginger Beer Mixer to make our Apple Cider Moscow Mule! 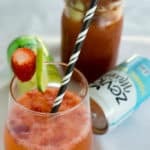 Recipe can be quickly added to MyFitnessPal - Search "KetoConnect - Strawberry Cocktail"
Recipe can be quickly added to MyFitnessPal - Search "KetoConnect - Bloody Mary"
This post is sponsored by Zevia. Add the chopped up strawberries and liquid stevia to the bottom of a glass. Using a spoon or any kitchen tool that can be used to muddle, muddle the strawberries and stevia until it is mush. Add 3-4 ice cubes, pour the vodka in and fill the glass up with half or a full can of the dry lemon lime mixer. If desired, strain the drink so you don't have free floating strawberries in the glass. Wet the rim of the glass or mason jar and dip it in salt of choosing (we used red). Add 3-4 cubes of ice to the glass. Pour the tomato sauce over the ice and add the hot sauce, lemon juice, olive juice and worcestershire sauce to the glass. Add the 3 ounces of vodka (2 shots) and tonic water mixer to the glass and stir with a spoon. If desired, garnish with the optional ingredients above (bacon, cheese, olives, pickles and celery), using toothpicks.